During the Revolutionary struggles in France and the subsequent religious upheavals under Napoleon, many monastic institutions on the continent were 'secularised' and their buildings destroyed. The abbey of Mariawald was closed down in 1802 but fortunately its buildings, including the cloisters, remain largely intact. However, the stained glass windows had been removed and it is believed that they were purchased by John Christopher Hampp of Norwich. Hampp sold the Mariawald panels to various churches and to private collectors. Many of these were purchased by the collector, Lord Brownlow who had them installed in his new chapel at Ashridge Park in Hertfordshire between 1811 and 1831. W are able to reconstruct how the panels were placed in the cloister windows. Each window was composed of two openings ('lights'). Each light was composed of three large panels, plus one small tracery panel. So there would have been eight panels to each window. From the surviving stained glass panels we can determine the theme of the cloister glazing. Each window had two panels depicting scenes from the Old Testament and two panels with scenes from the New Testament. Above the biblical story panels, were two smaller prophet (or 'messenger') panels. These contained half-images of Old Testament prophets holding scrolls with text relating to biblical passages connected with the scenes below. At the base of each window were donor and patron saint panels. These donors were the ones who contributed to the financing of the cloister glazing. This type of narrative arrangement is known as 'typological'. Each Old Testament story was a 'type' or a prefigurement of a New Testament story ('antitype'). The prophets on each window would hold text from the Bible relating to the Old and New Testament stories. For example, the Old Testament story of the 'Sacrifice of Isaac by Abraham' was seen as a prefigurement of the New Testament story of 'Jesus Christ's Sacrifice on the Cross'. The donor in this panel is Adelheid who was the wife of Arnold von Loe. We can identify her from the inscription which runs along the banderole at the top of the curtain behind her. 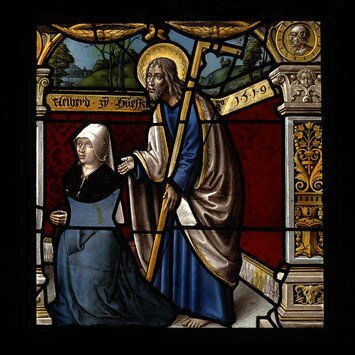 Adelheid and her husband would have contributed to the costs of one of the cloister windows. The typological arrangement was popular in the Middle Ages. The stories were reproduced in manuscripts and in engravings from woodcuts and collectively became known as 'Biblia Pauperum' ('Bibles of the Poor'). At the end of the 15th century the Biblia Pauperum were printed in book form and sold in their thousands. These books were used as design sources for artworks including stained glass panels. Adhelheid kneels in the left foreground, her hands clapsed in prayer. She wears a blue gown with a black collar and a white headress that covers her head, indicating her married status. Standing behind her and gesturing with his right hand is St James the Less. He holds a long hatter’s bow. James wears a blue gown with a white overmantel with yellow trim. The scene is enclosed in an Renaissance-style arcaded structure. Behind the figures is a red damasked cloth with a gold-coloured banner on top and text relating to the donor. In the background is a landscape painted in brown and silver stain on light blue glass. "AELHEYD zu HUESFRU Ao 1519"
Based upon the writings of Conrad and Kurthen, this panel was identified as depicting Adelheid, the wife of Arnold von Loe. Historical significance: V&A has two other panels with a similar pair of donors (C.291 and 318-1928). As the cloisters were never dismantled we can reconstruct how the panels were placed in the architectural structure. The window openings in the cloisters were each composed of two openings ('lights'). Each light was composed of three large panels, plus one small tracery panel. So there would have been eight panels to each window. This type of narrative arrangement is known as 'typological'. Each Old Testament story was a 'type' or a prefigurement of a New Testament story ('antitype'). For example, the Old Testament story of 'Elisha greeted by the Sons of the Prophet' was a prefigurement of the New Testament 'Entry of Christ into Jerusalem' which occurred on what we now call 'Palm Sunday'. Clear and coloured glass with painted details and yellow (silver) stain. Depicting the donor Adelheid and her patron saint James the Less. From the cloister of the Abbey of Mariawald. Made in Germany (Lower Rhine), dated 1519.